Wow! What a fabulous event! 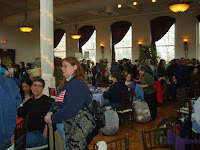 Yesterday, I went to the "Second Annual Homespun Yarn Party" at the Historic Savage Mill in Savage, MD. The Mill has a large variety of very eclectic shops with everything from homemade French Pastries to Antiques and Home Furnishings. All of the shops looked extremely interesting, but I stayed away from most of them and concentrated on the "Yarn Party". I started my day by arriving early...intending to have a leisurely lunch at one of the restaurants in the Mill. I was delighted to find that there was a pub there serving brunch - Rams Head Tavern. I joined three other ladies that I met in line - Leah, Rachel, and Margie. We had a fabulous time and the food was delicious! 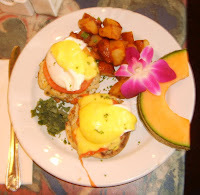 I had "Annapolis Benedict" - basically "Eggs Benedict" served on crab cakes instead of Canadian bacon. The presentation was just fabulous! 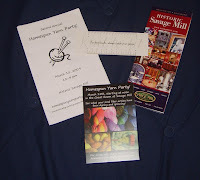 Next stop....the "Yarn Party"! Wahoo! I met some wonderful new friends while I was there as well as enjoying the company of old friends. I even ran into some folks from the various Secret Pal exchanges I've participate in...like my friend Jody (the designer of the Vineland Mittens). 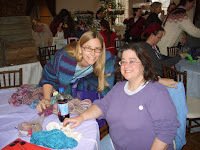 Pamela and Claire (left) stayed busy most of the afternoon at the "Charity Table" coordinating the charity knitting. However, Pamela did find some very unique yarns from "Loop" during one of her quick circuits around the booths (you can see the yarns on the table in front of Pamela). I was there with several other folks too - Janet, Lynn, Sue, and a few other new friends...I just don't have the group picture yet - I'll post it later when I get a copy of it. In the line waiting to enter the party, I met Pam. She was wearing an absolutely gorgeous shawl. 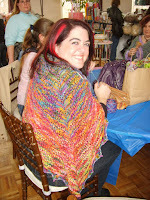 It's the "Charlotte's Web Shawl" from Noro. She wanted to make it a bit larger and so she used "Socks that Rock" yarn instead of Koigu. I love the vibrant colors! I just love it - and need to add it to my queue of "must do's"! 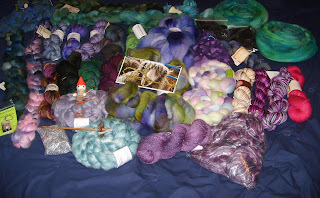 I managed to buy a few "non-fiber" items while I was there too. I couldn't resist the leather barrette for my hair - it was just too cute! 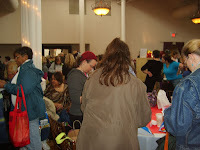 And there was a special deal on some handmade soap that smelled wonderful! Oh...and I did stop into the Antique area and picked up a button hook to go with my grandmother's celluloid dresser set. I did do quite a bit of damage to my checkbook during the party - I found some rovings and yarns that I just "had to have"! LOL! You all know how that goes, right? Anyhow, I did "discover" a new dyer that I absolutely love - "The Sanguine Gryphon" Her eye for color is phenomenal! I had a hard time limiting myself to just a few yarns! I also picked up some yarn with sterling silver through it at another booth - that will enable me to get the "glitz and gleam" associated with beads without taking the time to bead! 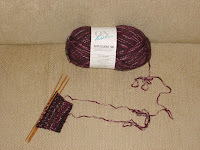 I'm planning to make a "Hanami Shawl" with the silver embellished yarn. 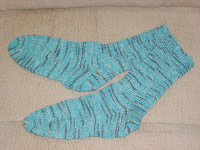 I finished my turquoise socks with the silver threads through it...I'm calling them "Ice Kissed Turqoise Socks"! I did notice that the Fortissima Socka Color is much rougher than the Lorna's Laces that I used for my last socks. Of course, nothing beats pure Merino, so I shouldn't be surprised by that. Normally, I'm not doing socks "back-to-back" so I don't usually notice the difference between the yarns, but this time, the difference was evident. I've also got another sock project underway. This time I'm using "On-line" yarn in the Sierra colorway. The colors look like dark chocolate and raspberry to me, so I'm going to call them my "Raspberry Dark Chocolate" socks. I will still be using the "Hellen's Favorite" sock pattern, but this time, I'll to a 2x2 rib so I can fold down the socks if I want to. I have yet to start my "Stricken" socks. They'll be made in a teal colorway out of "Socks That Rock". I've been putting off starting them as they're being done as part of a KAL, but don't have to be complete until May 1. I definitely have to pay attention to my knitting while I work on these...whereas the "Raspberry Dark Chocolate" socks are more of a mindless knit that I can do on the Metro. Whew. I've had a busy week! However, I did manage to work in some knitting. I've completed another block in the "Block of the Month KAL" on Ravelry. I have not yet blocked this one - it's a nice lace pattern. 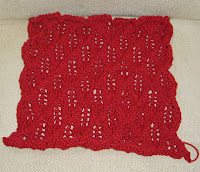 My plans are to complete all 12 blocks this year and stitch it together into an adult sized blanket for Project Linus. As a result, I'm using RedHeart acrylic. I started another pair of socks on February 20th and am about 75% done at this point. Socks knit up quite fast during my morning commute....as long as I get a seat! These are being knit up in Fortissima Colori Socka Color. It has a silver thread running through it that makes it glisten like crystals of ice. I should be able to finish these by the end of the week! Oh, the new Knitty is out...and it has lots of gorgeous patterns! I've added 3 to my "queued" projects: "Shipwreck'', "Decimal", and "Imagine". Geez....I keep adding to my queue, but never starting anything that's in my queue! Somehow, I keep finding other projects to keep me busy! 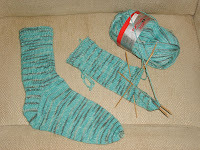 One thing I still need to do is to start my "Stricken" socks (a Cookie A pattern). 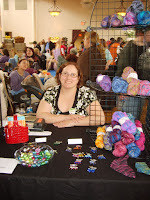 I'm doing it as a KAL in the MA group on Ravelry as well. All I've done so far is purchase the pattern and wind my yarn. I'm using Socks-that-Rock in a teal colorway. I love it! On the spinning front, I haven't done much of that lately. I've been concentrating on knitting. 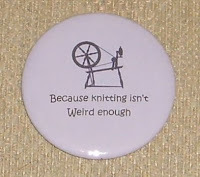 So, for now, all I have to show for spinning is a really cool magnet that I got from my spinning swap partner. I'll show the roving and resultant yarn as soon as I get back to spinning....it may be a while though as I have a couple of KALs that I need to get busy with - the Sock KAL I mentioned above and a charity KAL for babies sponsored by my friend Kerrie. Yes....love is definitely my word. 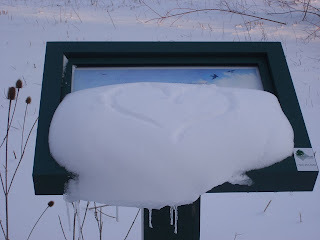 On Monday, when walking my dog in the morning, I drew a heart on the meadow placard next to the path we usually walk on. That evening, I brought my camera with me and managed to take a picture of it as it was beginning to melt and slide off the placard! 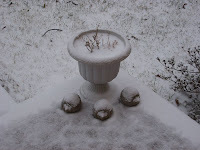 Yesterday, we got a little prelude of the snow to come. 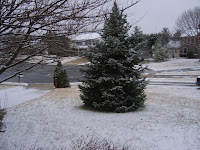 With a dusting of snow and sleet overnight, and temperatures just above freezing, it wasn't too bad. 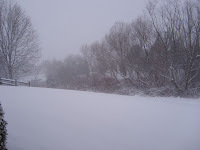 The roads were clear, and there was just enough snow to make it look pretty outside. The hedghogs were gently dusted as well. 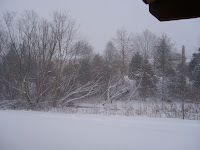 I LOVE the snow...it's so pretty! 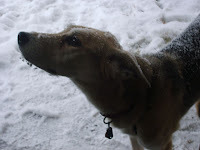 There's nothing like a long walk in the gently falling snow. 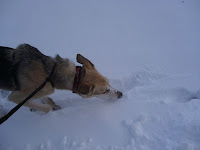 Today, however, the walk with the dog wasn't quite the idyllic walk that it usually is. The snow itself was quite pretty, but the winds have kicked up and with a temp of 21 degrees, the wind chill brings it down to the single digits. It also drives the snow right into your face and tends to clear the snow off the trees and rooftops....again, driving it right into your face. 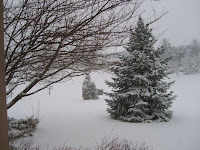 In spite of all of the negative with today's snow, I still love it....and I still love walking in the snow. Even in the less than idyllic circumstances. 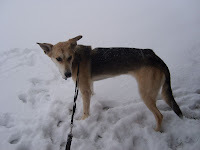 Even my dog also loves the snow - as a shepherd-huskie mix, she's a natural for this weather. 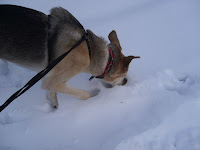 She gets an added spring in her step whenever we walk in the snow. 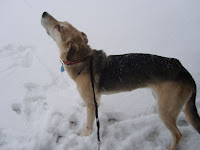 She loves to sniff the air, catch snowflakes as they descend from the sky, scoop up mouthfuls of snow as we walk, and discover all the new scents that seem to come with the snow. 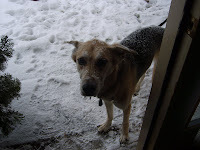 At the end of our walk...covered in a light coating of snow. 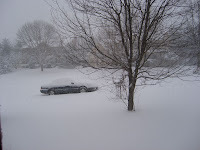 As of 7 am, we had about 7 1/4 inches of snow at my house. That was enough to nearly hide my hedgies.....poor babies! 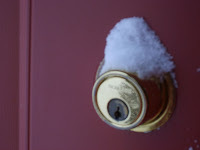 The annoying wind, in addition blowing snow in my face as I walked my dog, created a snow drift just outside my front door...and added a "mini-drift" on my door lock! 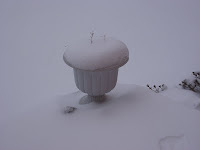 It's still snowing - who knows how much we'll have by the time it all ends!